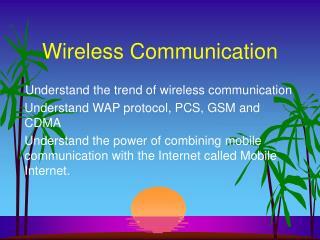 Understand the power of combining mobile communication with the Internet called Mobile Internet. 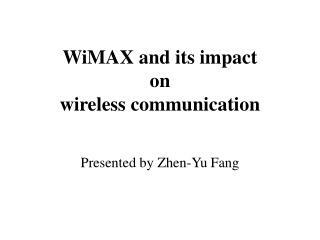 3G, "3rd generation",, generally applied to wideband mobile services and applications. 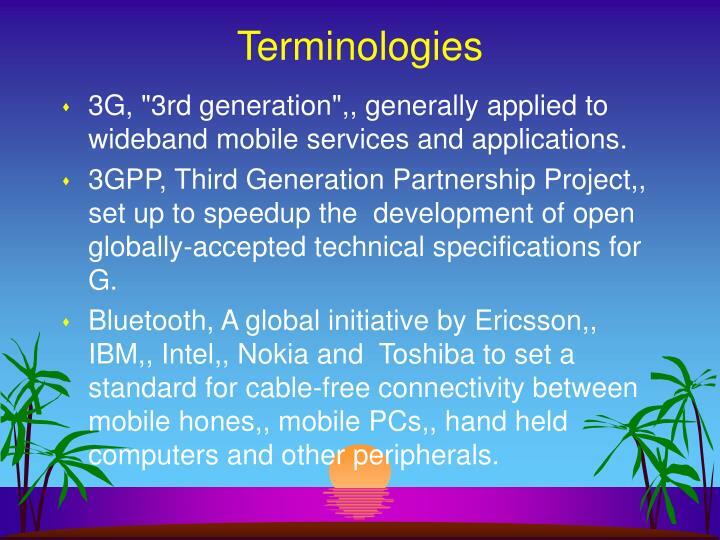 3GPP, Third Generation Partnership Project,, set up to speedup the development of open globally-accepted technical specifications for G.
Bluetooth, A global initiative by Ericsson,, IBM,, Intel,, Nokia and Toshiba to set a standard for cable-free connectivity between mobile hones,, mobile PCs,, hand held computers and other peripherals. 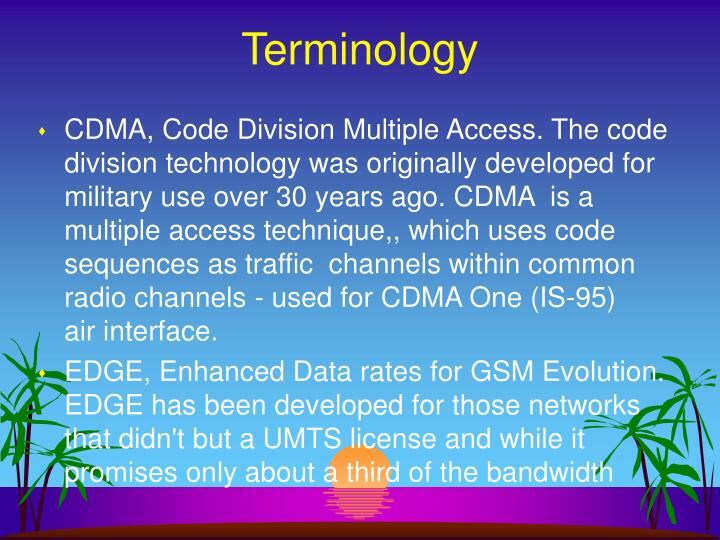 CDMA, Code Division Multiple Access. The code division technology was originally developed for military use over 30 years ago. CDMA is a multiple access technique,, which uses code sequences as traffic channels within common radio channels - used for CDMA One (IS-95) air interface. GPRS, General Packet Radio Systems. 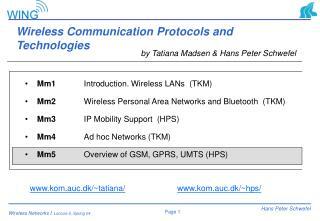 GPRS is hailed as the 2.5 for mobile phones and will be with us from the beginning of 2001. GPRS will give you a permanent connection at about 50 kbps or so to your mobile phone. 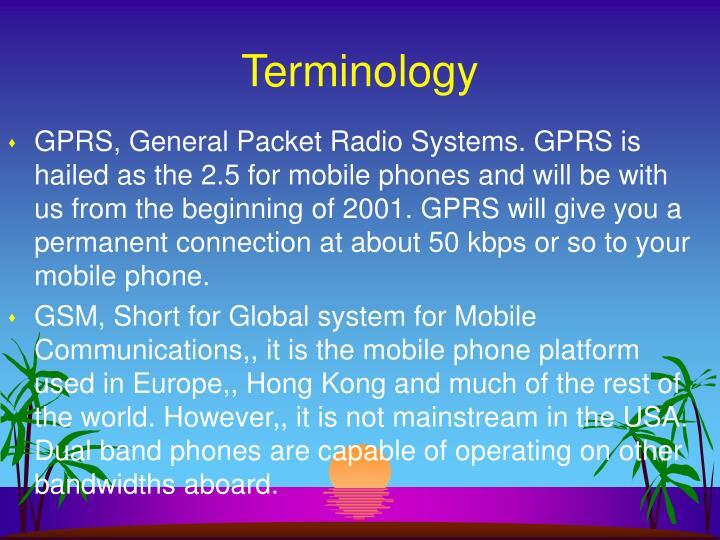 GSM, Short for Global system for Mobile Communications,, it is the mobile phone platform used in Europe,, Hong Kong and much of the rest of the world. However,, it is not mainstream in the USA. Dual band phones are capable of operating on other bandwidths aboard. 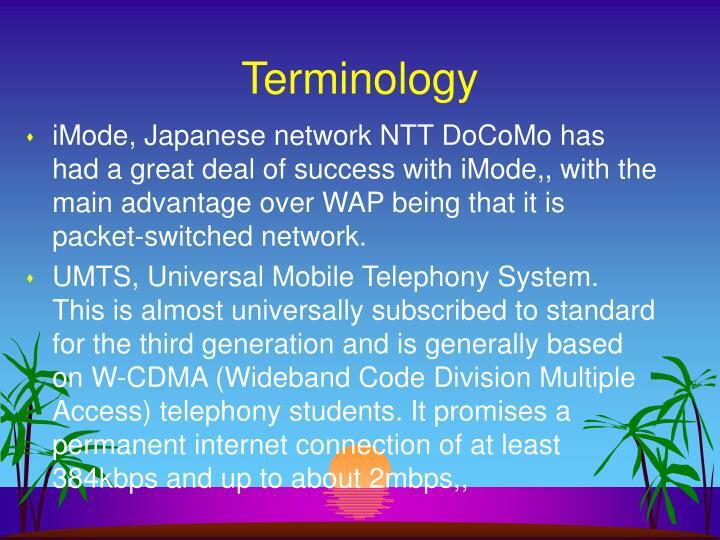 iMode, Japanese network NTT DoCoMo has had a great deal of success with iMode,, with the main advantage over WAP being that it is packet-switched network. The television signals that we are using are analogous, not digital. 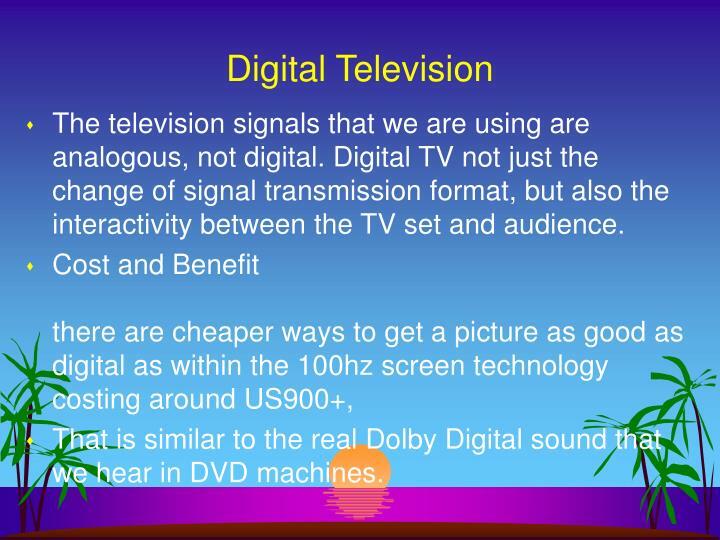 Digital TV not just the change of signal transmission format, but also the interactivity between the TV set and audience. That is similar to the real Dolby Digital sound that we hear in DVD machines. 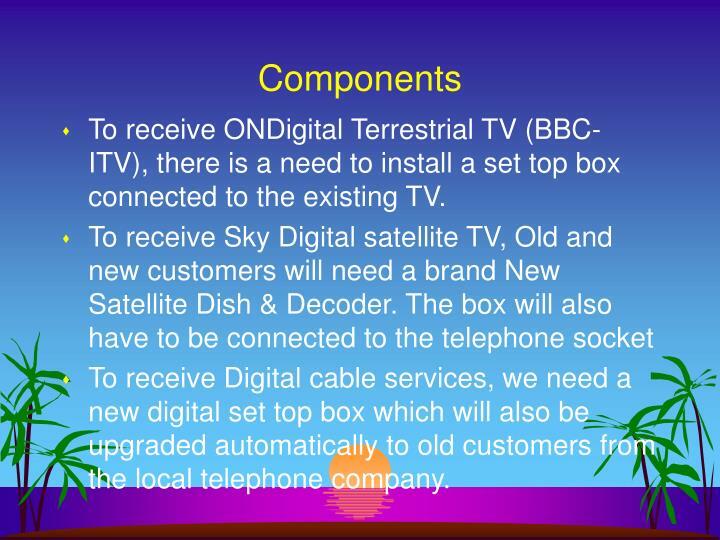 To receive ONDigital Terrestrial TV (BBC-ITV), there is a need to install a set top box connected to the existing TV. To receive Digital cable services, we need a new digital set top box which will also be upgraded automatically to old customers from the local telephone company. 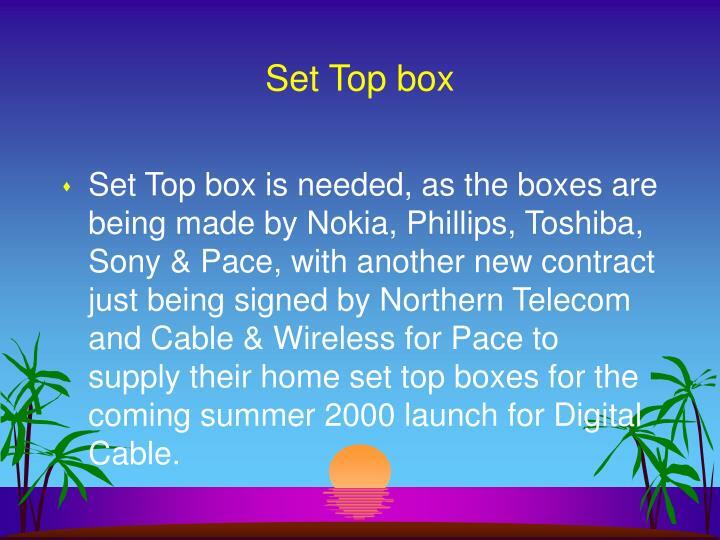 Set Top box is needed, as the boxes are being made by Nokia, Phillips, Toshiba, Sony & Pace, with another new contract just being signed by Northern Telecom and Cable & Wireless for Pace to supply their home set top boxes for the coming summer 2000 launch for Digital Cable. PCS networks operate similarly to other radio technologies in that signals are sent using a series of transmitters (also called base stations) mounted on buildings, free-standing towers and other structures. 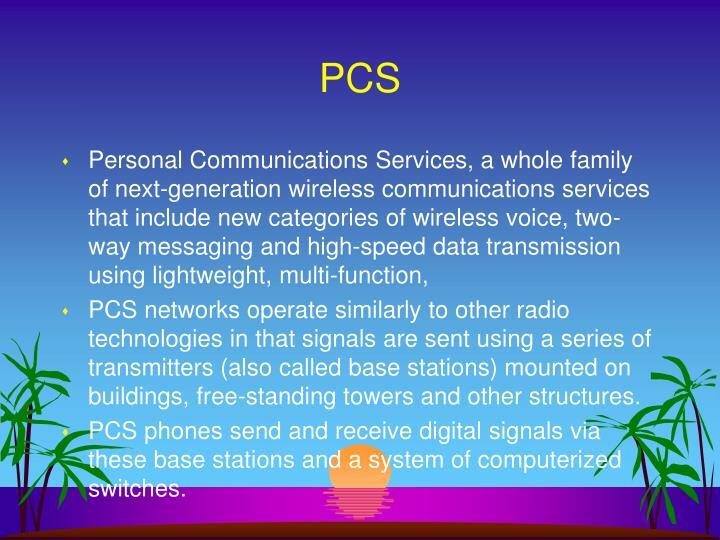 PCS phones send and receive digital signals via these base stations and a system of computerized switches. 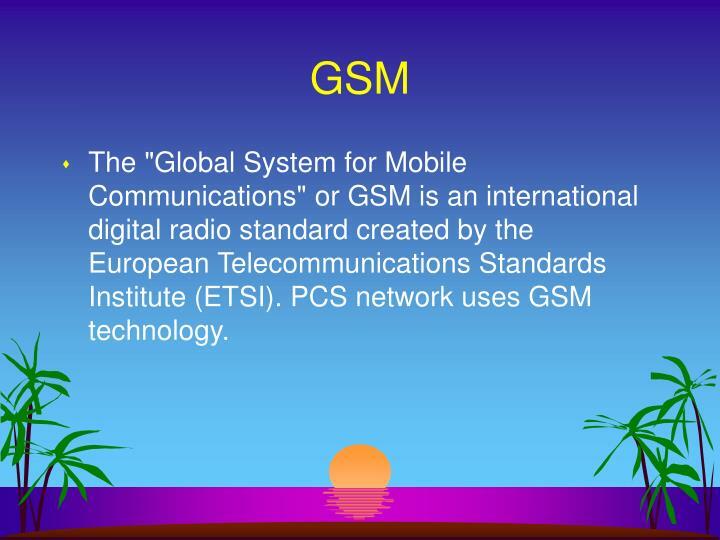 The "Global System for Mobile Communications" or GSM is an international digital radio standard created by the European Telecommunications Standards Institute (ETSI). 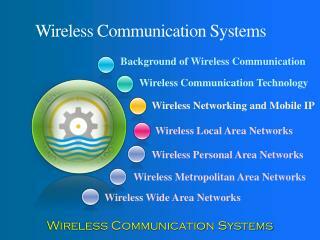 PCS network uses GSM technology. 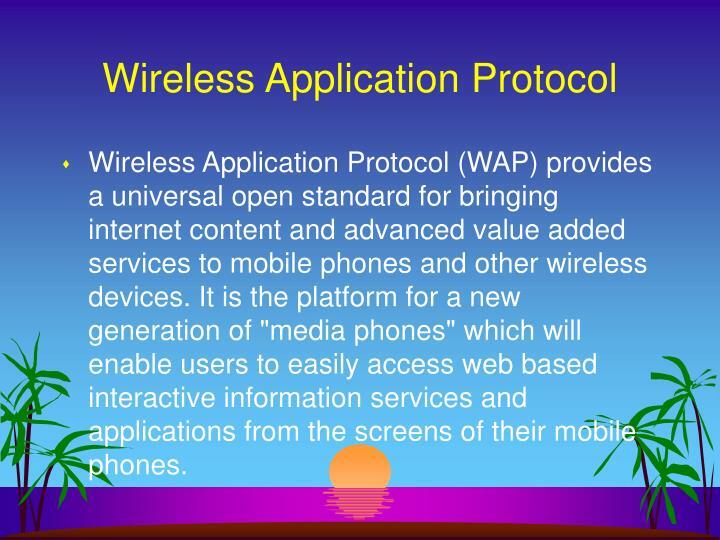 Wireless Application Protocol (WAP) provides a universal open standard for bringing internet content and advanced value added services to mobile phones and other wireless devices. 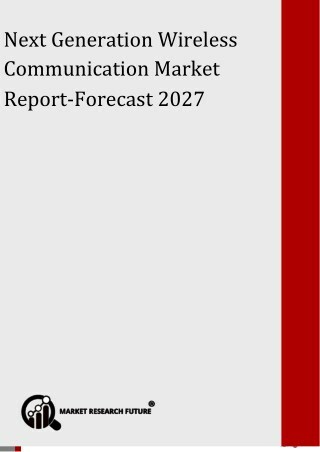 It is the platform for a new generation of "media phones" which will enable users to easily access web based interactive information services and applications from the screens of their mobile phones. 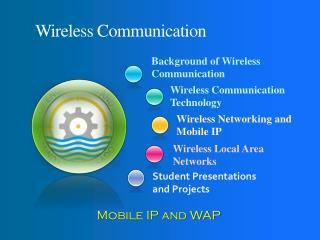 WAP gives mobile access to information and services for small wireless devices as i.e. mobile phones and PDAs. 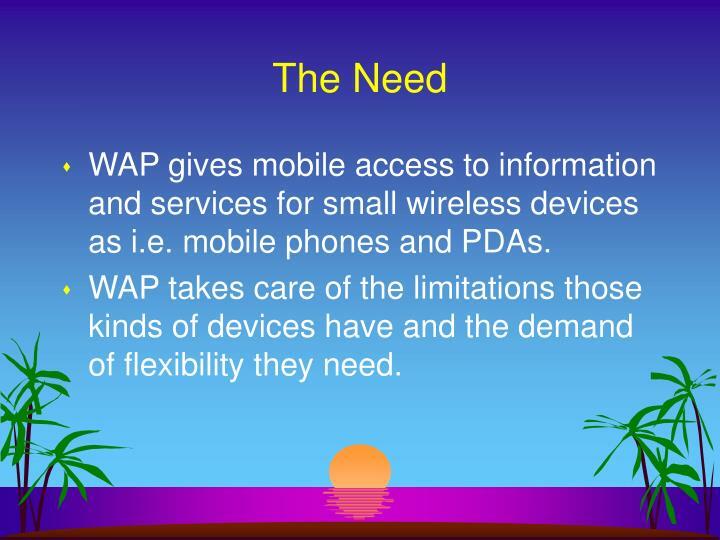 WAP takes care of the limitations those kinds of devices have and the demand of flexibility they need. 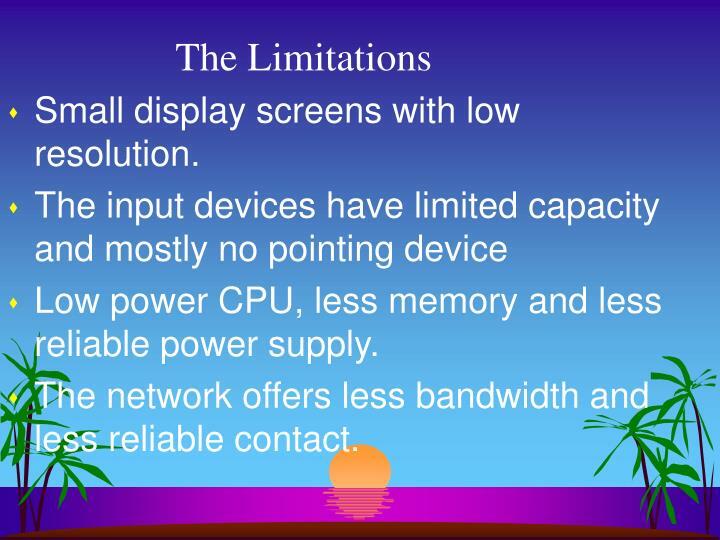 Small display screens with low resolution. Low power CPU, less memory and less reliable power supply. 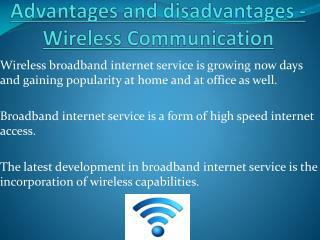 The network offers less bandwidth and less reliable contact. When it is compared to i.e. 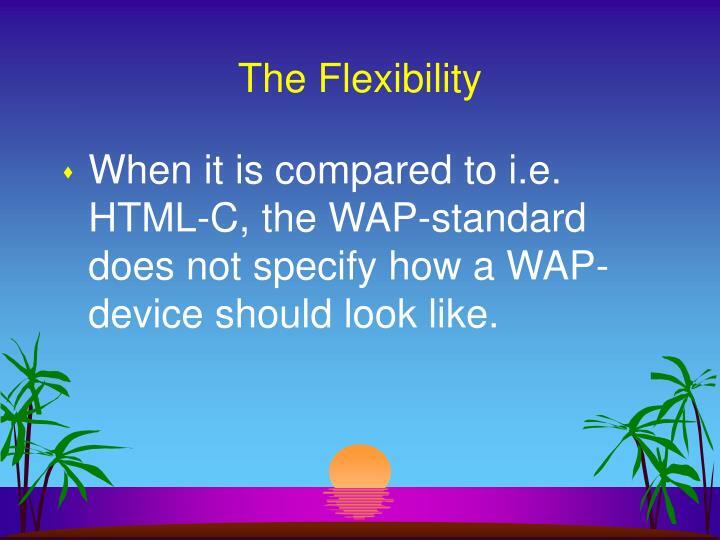 HTML-C, the WAP-standard does not specify how a WAP-device should look like. 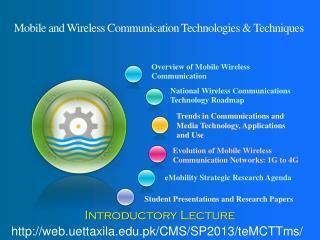 It is important because the combination of mobile phone and the Internet is the trend. 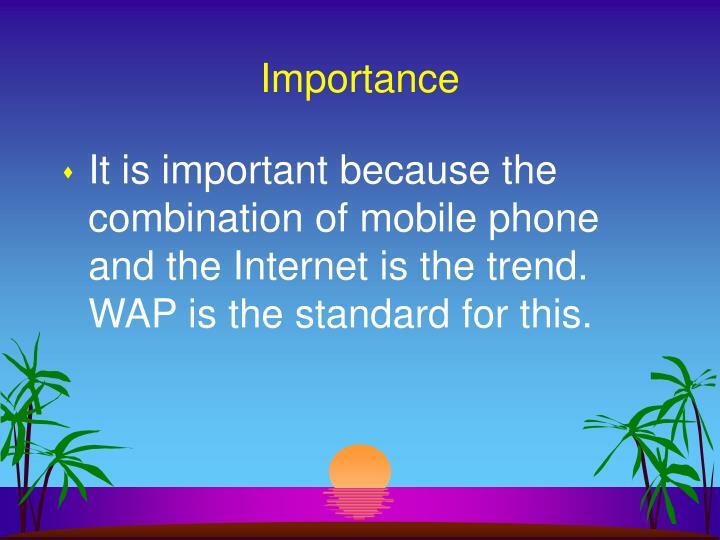 WAP is the standard for this. 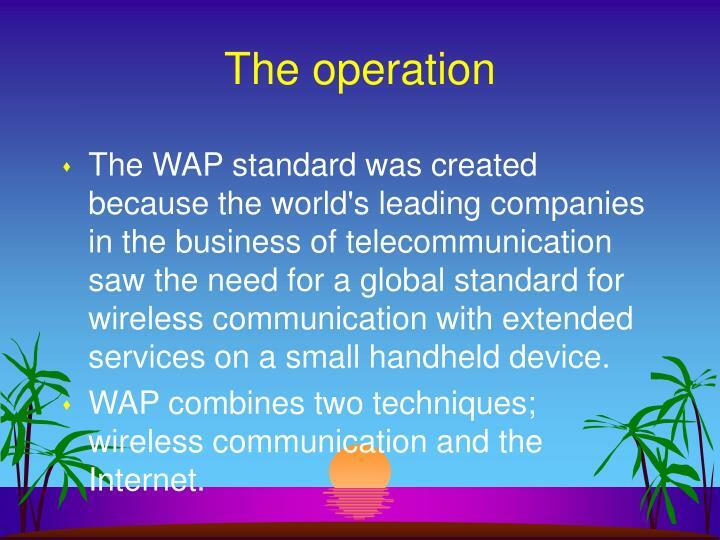 The WAP standard was created because the world's leading companies in the business of telecommunication saw the need for a global standard for wireless communication with extended services on a small handheld device. WAP combines two techniques; wireless communication and the Internet. 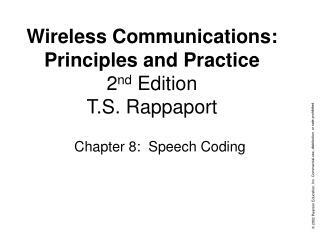 Wireless Session Protocol (WSP) This layer offers mainly two session services; connection session and connectionless session. It provides a light-weight transaction-oriented protocol that is suitable for mobile clients. It can be used for secure communication between terminals and business cards. 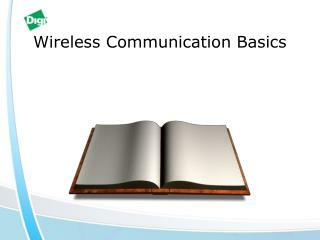 It is the Wireless bearers and is designed to operate over a variety of bearer services, like SMS, CDMA, CSD and more. 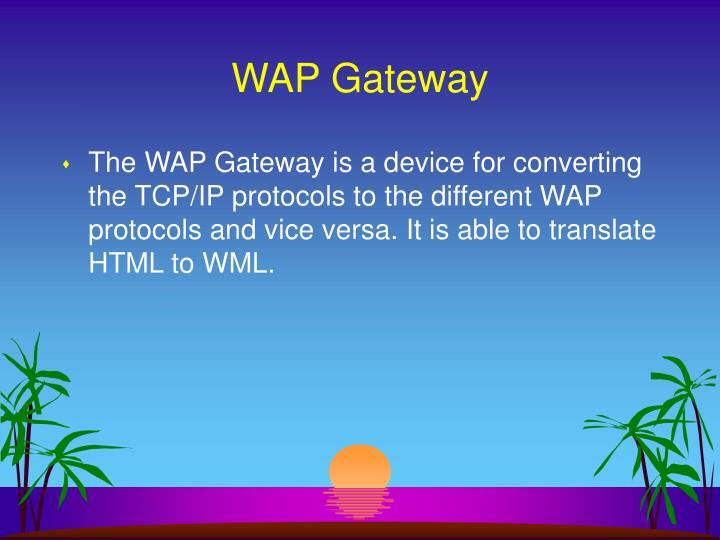 The WAP Gateway is a device for converting the TCP/IP protocols to the different WAP protocols and vice versa. 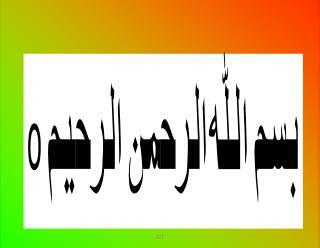 It is able to translate HTML to WML. 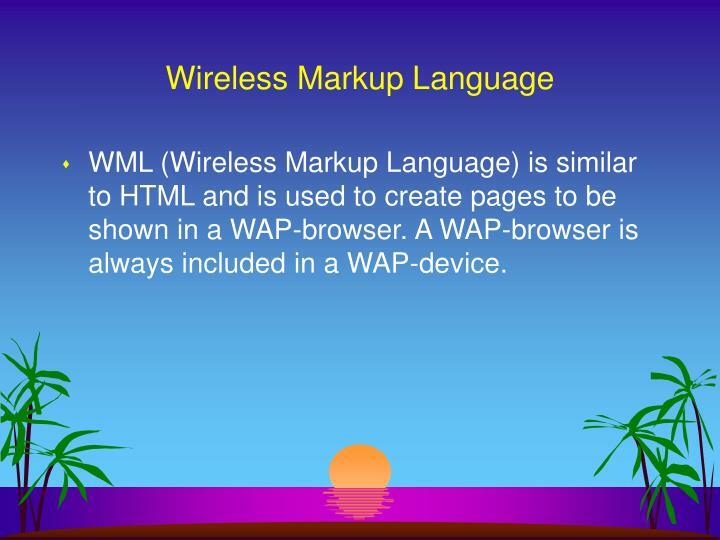 WML (Wireless Markup Language) is similar to HTML and is used to create pages to be shown in a WAP-browser. 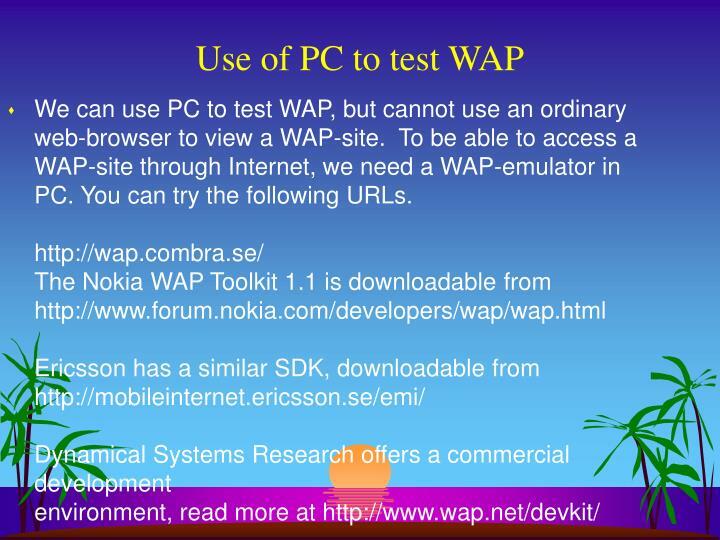 A WAP-browser is always included in a WAP-device. 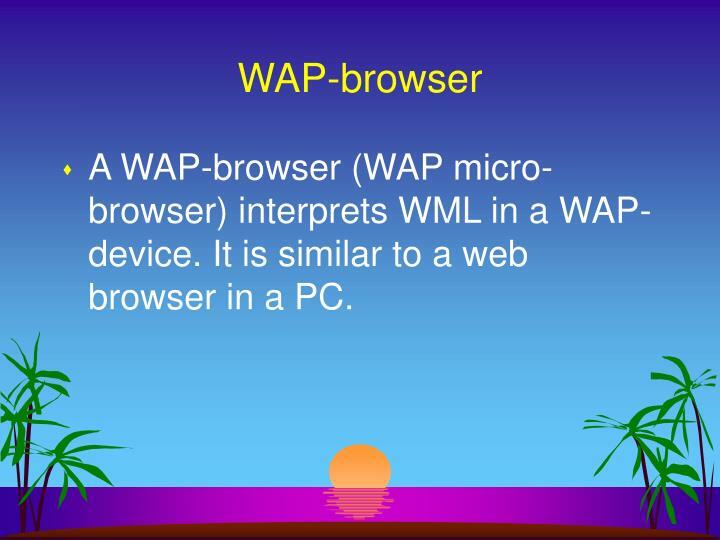 A WAP-browser (WAP micro-browser) interprets WML in a WAP-device. It is similar to a web browser in a PC. 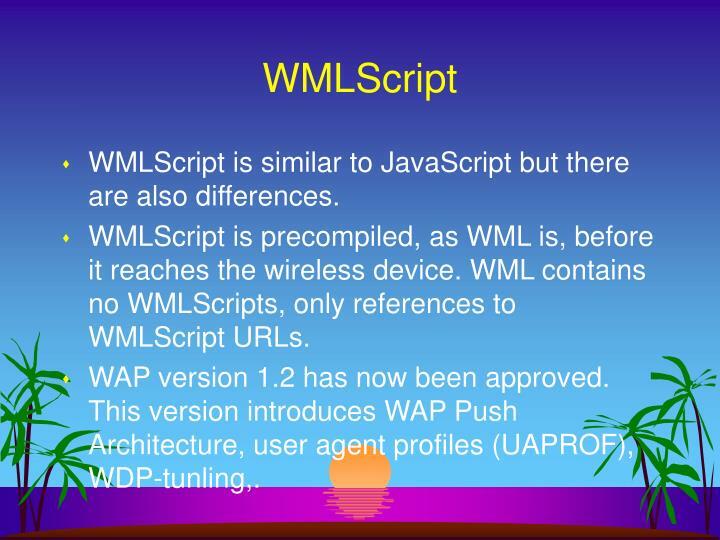 WMLScript is precompiled, as WML is, before it reaches the wireless device. WML contains no WMLScripts, only references to WMLScript URLs. WAP version 1.2 has now been approved. 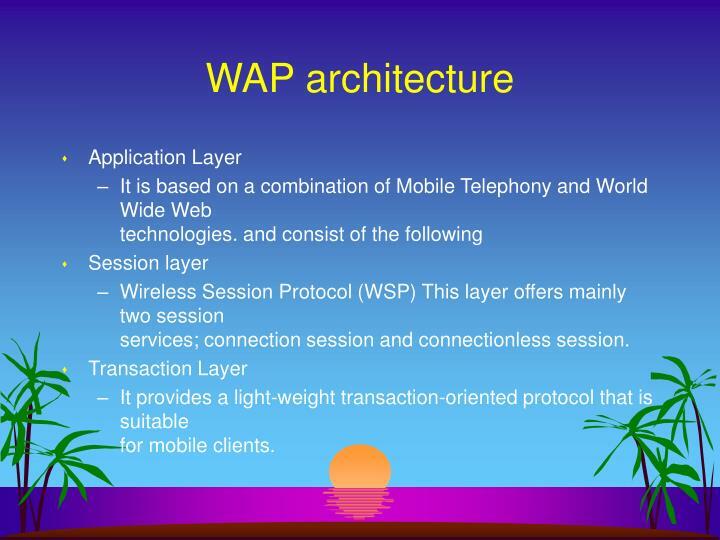 This version introduces WAP Push Architecture, user agent profiles (UAPROF), WDP-tunling,. 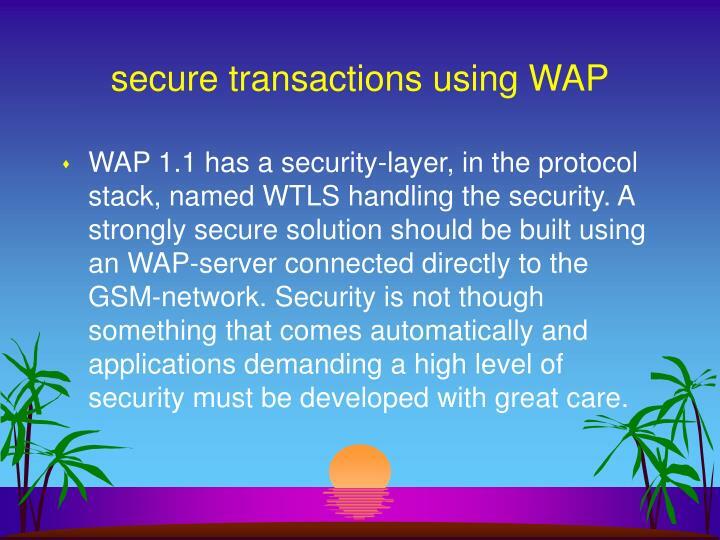 WAP 1.1 has a security-layer, in the protocol stack, named WTLS handling the security. 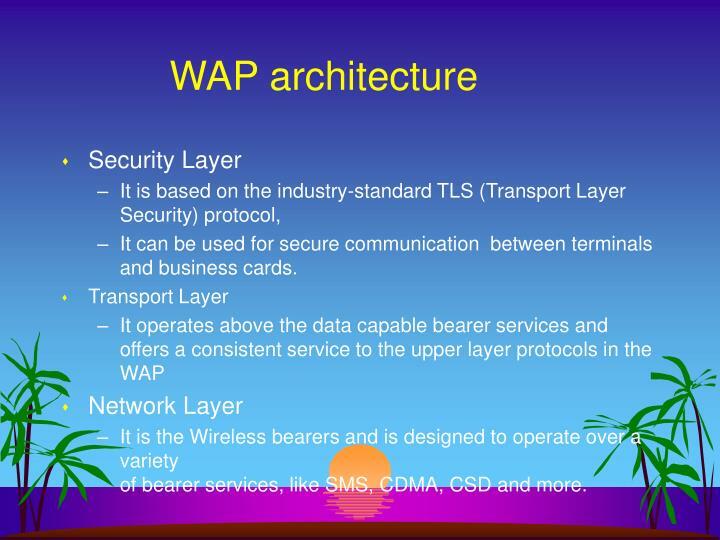 A strongly secure solution should be built using an WAP-server connected directly to the GSM-network. Security is not though something that comes automatically and applications demanding a high level of security must be developed with great care. 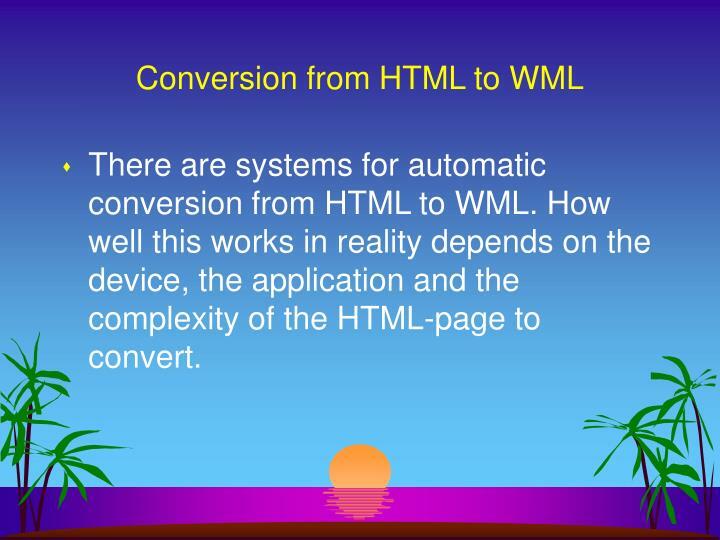 There are systems for automatic conversion from HTML to WML. How well this works in reality depends on the device, the application and the complexity of the HTML-page to convert. 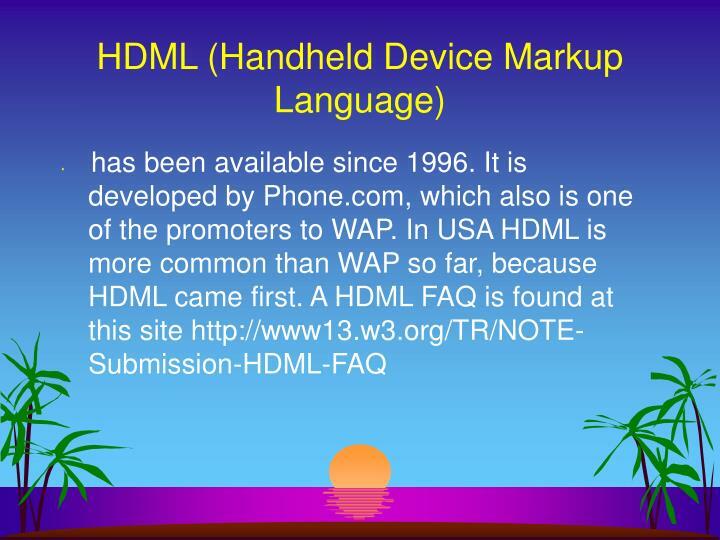 This is a variant of HTML with some added tags to make it usable on a cellular like wap-device. 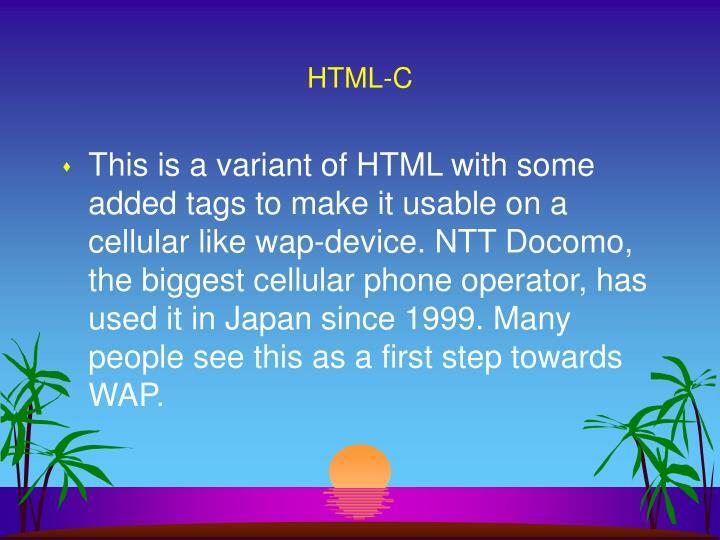 NTT Docomo, the biggest cellular phone operator, has used it in Japan since 1999. 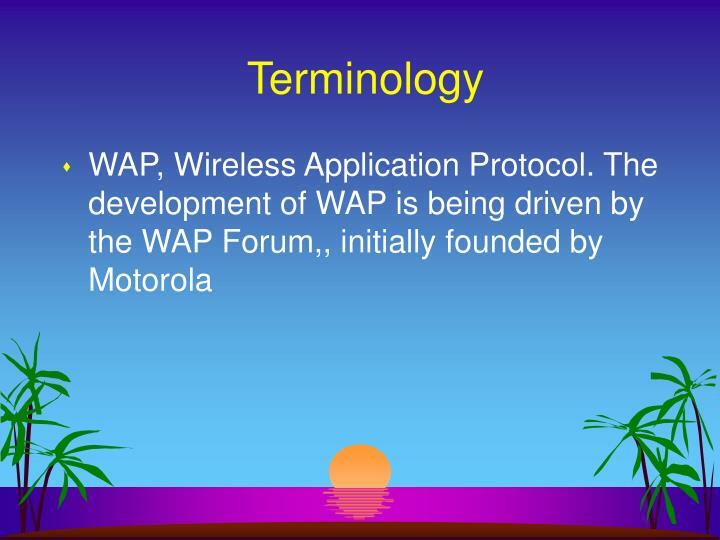 Many people see this as a first step towards WAP. A new radio communications technology that will create a "bit pipe" for providing mobile access to internet-based services.. In the near future, mobility won't be an add-on: it will become a fundamental aspect of many services. We'll expect high-speed access to the internet, entertainment, information and electronic commerce. 3G services will add an invaluable mobile dimension to services that are already becoming an integral part of modern business life:. 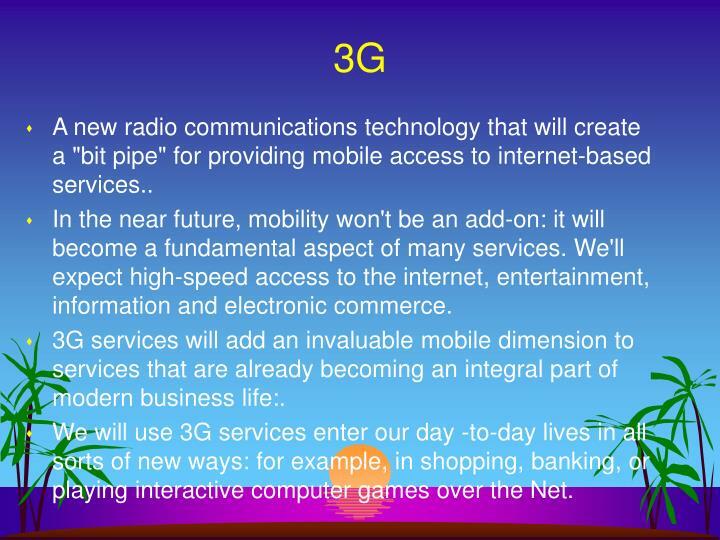 We will use 3G services enter our day -to-day lives in all sorts of new ways: for example, in shopping, banking, or playing interactive computer games over the Net. 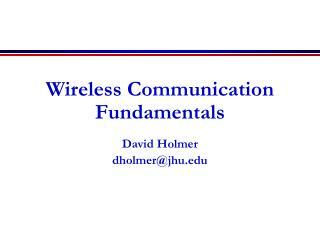 NETW 701:Wireless Communications -. 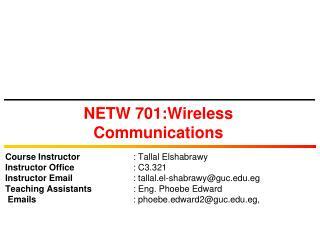 course instructor : tallal elshabrawy instructor office	: c3.321 instructor email : tallal.el-shabrawy@guc.edu.eg	teaching assistants : eng. phoebe edward emails	: phoebe.edward2@guc.edu.eg,. 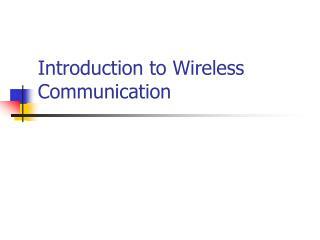 Wireless Communication -. 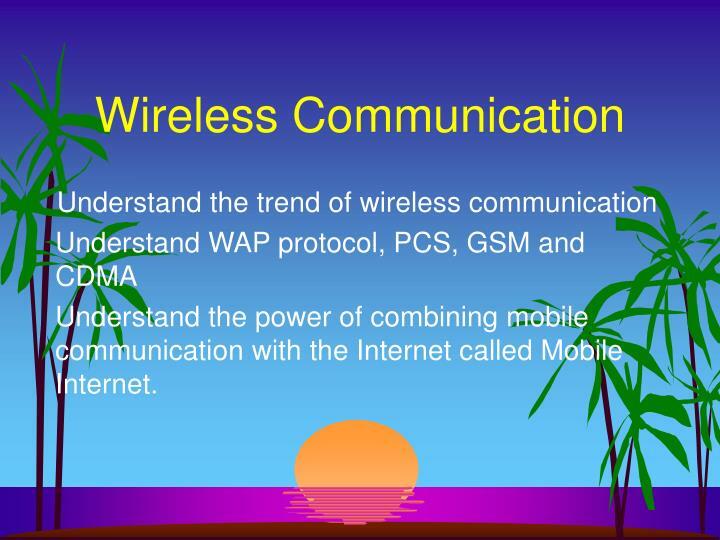 understand the trend of wireless communication understand wap protocol, pcs, gsm and cdma understand the power of combining mobile communication with the internet called mobile internet. 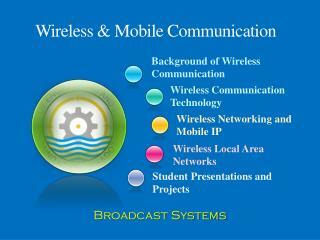 Wireless Communication Systems -. 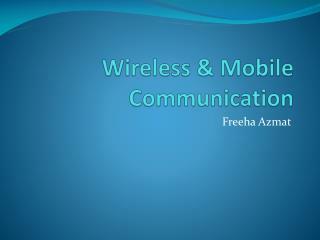 background of wireless communication. 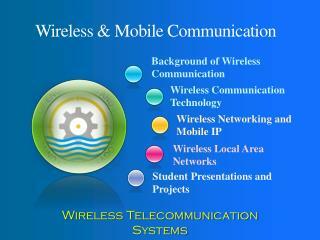 wireless communication technology. 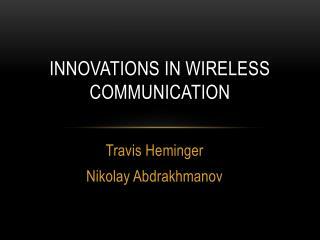 wireless networking and mobile ip. 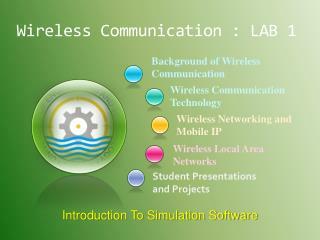 wireless local area networks. 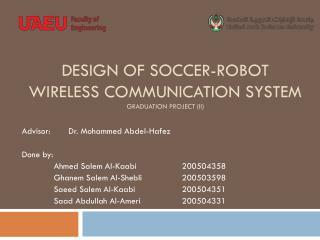 wireless personal area networks. 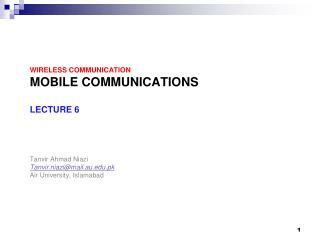 wireless metropolitan area networks.